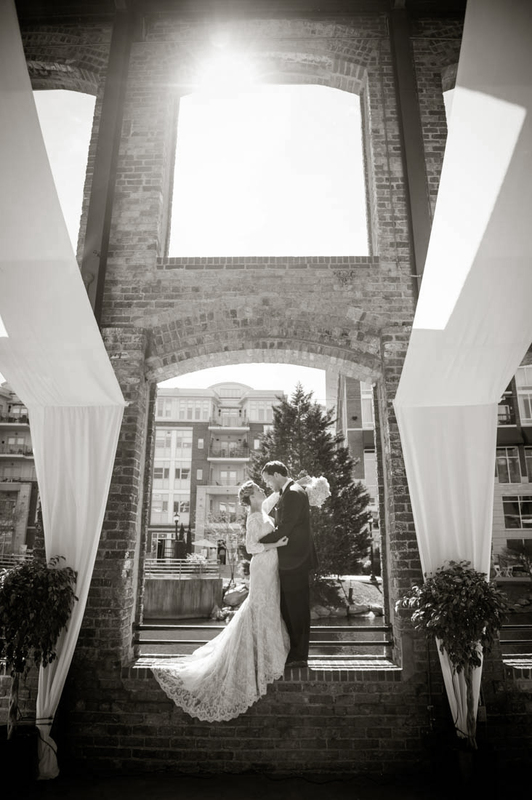 Standing on the ledge of an opening in the Wyche Pavilion in Greenville, SC, the happy bride and groom lovingly gaze at each other. The Wyche Pavilion in downtown Greenville South Carolina looks over the Reedy River. This building is historic to downtown Greenville and is owned by Larkins on the River. The Pavilion is made up of walls of window arches on each wall giving a great view of the river and a nice breeze. This lovely couple used one of the arch ways in their shot to capture the rustic but historic feel of the Pavilion a but also making it their own with the drapery and flowers. The sun played a amazing role by peaking out through the top window.